Bite. Melee Weapon Attack: +11 to hit, reach 10 ft., one target. Hit: 17 (2d10 + 6) piercing damage plus 7 (2d6) poison damage. Poison Breath (Recharge 5–6). The dragon exhales poisonous gas in a 60-foot cone. Each creature in that area must make a DC 18 Constitution saving throw, taking 56 (16d6) poison damage on a failed save, or half as much damage on a successful one. The most cunning and treacherous of true dragons, green dragons use misdirection and trickery to get the upper hand against their enemies. 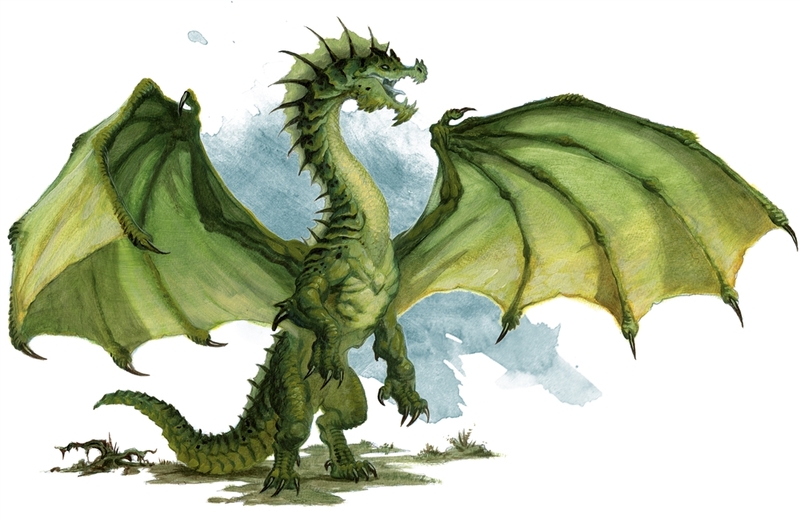 A green dragon is recognized by the crest that begins near its eyes and continues down its spine, reaching full height just behind the skull. The forest-loving green dragons sometimes compete for territory with black dragons in marshy woods and with white dragons in subarctic taiga. However, a forest controlled by a green dragon is easy to spot. A perpetual fog hangs in the air in a legendary green dragon’s wood, carrying an acrid whiff of the creature’s poison breath. The moss-covered trees grow close together except where winding pathways trace their way like a maze into the heart of the forest. The light that reaches the forest floor carries an emerald green cast, and every sound seems muffled. At the center of its forest, a green dragon chooses a cave in a sheer cliff or hillside for its lair, preferring an entrance hidden from prying eyes. Some seek out cave mouths concealed behind waterfalls, or partly submerged caverns that can be accessed through lakes or streams. Others conceal the entrances to their lairs with vegetation. Grasping roots and vines erupt in a 20-foot radius centered on a point on the ground that the dragon can see within 120 feet of it. That area becomes difficult terrain, and each creature there must succeed on a DC 15 Strength saving throw or be restrained by the roots and vines. A creature can be freed if it or another creature takes an action to make a DC 15 Strength check and succeeds. The roots and vines wilt away when the dragon uses this lair action again or when the dragon dies. A wall of tangled brush bristling with thorns springs into existence on a solid surface within 120 feet of the dragon. The wall is up to 60 feet long, 10 feet high, and 5 feet thick, and it blocks line of sight. When the wall appears, each creature in its area must make a DC 15 Dexterity saving throw. A creature that fails the save takes 18 (4d8) piercing damage and is pushed 5 feet out of the wall’s space, appearing on whichever side of the wall it wants. A creature can move through the wall, albeit slowly and painfully. For every 1 foot a creature travels through the wall, it must spend 4 feet of movement. Furthermore, a creature in the wall’s space must make a DC 15 Dexterity saving throw once each round it’s in contact with the wall, taking 18 (4d8) piercing damage on a failed save, or half as much damage on a successful one. Each 10-foot section of wall has AC 5, 15 hit points, vulnerability to fire damage, resistance to bludgeoning and piercing damage, and immunity to psychic damage. The wall sinks back into the ground when the dragon uses this lair action again or when the dragon dies. Magical fog billows around one creature the dragon can see within 120 feet of it. The creature must succeed on a DC 15 Wisdom saving throw or be charmed by the dragon until initiative count 20 on the next round. Thickets form labyrinthine passages within 1 mile of the dragon’s lair. The thickets act as 10-foot-high, 10-foot-thick walls that block line of sight. Creatures can move through the thickets, with every 1 foot a creature moves costing it 4 feet of movement. A creature in the thickets must make a DC 15 Dexterity saving throw once each round it’s in contact with the thickets or take 3 (1d6) piercing damage from thorns. Each 10-foot-cube of thickets has AC 5, 30 hit points, resistance to bludgeoning and piercing damage, vulnerability to fire damage, and immunity to psychic and thunder damage. Within 1 mile of its lair, the dragon leaves no physical evidence of its passage unless it wishes to. Tracking it there is impossible except by magical means. In addition, it ignores movement impediments and damage from plants in this area that are neither magical nor creatures, including the thickets described above. The plants remove themselves from the dragon’s path. Rodents and birds within 1 mile of the dragon’s lair serve as the dragon’s eyes and ears. Deer and other large game are strangely absent, hinting at the presence of an unnaturally hungry predator. If the dragon dies, the rodents and birds lose their supernatural link to it. The thickets remain, but within 1d10 days, they become mundane plants and normal difficult terrain, losing their thorns. "A green dragon is recognized by the crest that begins near its eyes and continues down its spine, reaching full height just behind the skull." I should rather imagine that a green dragon is most often recognized by the fact that it is both green and a bloody dragon! It aint bloody til it gets in a serious fight or until it meets my party in a few weeks im gonna skin this thing alive and have it made into armor.